High Pressure Air Injection (HPAI) is a proven technique for recovery of light oil that is a pressure maintenance technique which displaces oil immiscibly. The benefit is that gas dissolves in the oil, swells the oil and reduces its viscosity. As pointed out elsewhere, if enough gas dissolves in the oil, the displacement is called miscible even though it isn’t. These mechanisms apply to all oils and mean that HPAI can be used to recovery heavy oil which is too deep for traditional steam injection. The concentration of oxygen is much higher so combustion of residual oil is much faster. These two factors combine to make HPAI a potentially very important method for producing several trillion barrels of deep heavy oil in the world. The following figure illustrates what happens. The figure shows that flue gas which moves ahead of the hot combustion zone reduces the viscosity of the oil. Then a steam zone continues to reduce the oil’s viscosity. The steam zone is created by evaporation of water in the combustion zone. The water can be pore water, water imbibing into the combustion zone from above or below or water coinjected with the air. An air to water ratio of 3 mcf/bbl works very well because 3 mcf of air can convert one barrel of water to steam. The temperature is lower behind the combustion because cooler fluids are being injected. Everything in this figure to the right of the combustion zone appears in a figure show when the benefits gas and steam coinjection was discussed. This means first that oil production is accelerated by in situ combustion just like it is by gas coinjected with steam or water. Now, the region to the left side of the figure above is cooling. This means that heat losses to the base and cap rock are lower than they are in a steam flood where the steam zone exists all the way to the injector. In addition, because the reservoir pressure is higher, the steam and gas do not override the reservoir as easily, therefore oxygen can’t be produced quickly. This combination of mechanisms means that high-pressure, in-situ combustion is the low cost process for producing deeper heavy oil. The following two figures illustrate why steam injection in deeper reservoirs is inefficient and how much deep heavy oil exists in the world. The first figure presents results of a calculation of steam quality reduction as energy is lost from steam flowing down the wellbore. The figure shows that steam quality decreases steadily as the depth increases. Steam quality is the weight fraction of water that is in the vapor phase. The figure shows that 700 barrels/day of 80 percent quality steam have been converted to hot water at 1,800 meters ( 5,900 feet) and that the quality falls below 50 percent below 800 meters. Thus, there are very few steam injection projects in reservoirs deeper than 2,500 feet. Below that depth HPAI could be the best method for recovery of the oil. 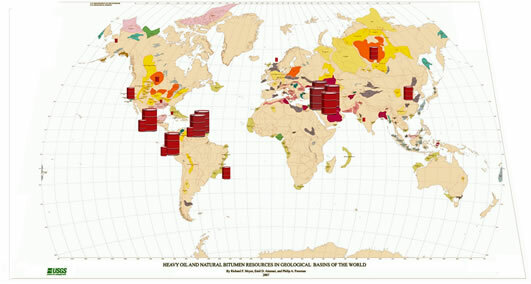 The second figure shows where the six trillion barrels of deep heavy oil is located in the world. Approximately 70 percent is found in the Middle East and Latin America. Most of the remainder is in Alaska, California, China and Russia. The figure contains some interesting data. For example, Canada has a large volume of heavy oil, but most of it is shallow so, it ISC isn’t necessary. Mexico in contrast has a large volume of heavy oil, but much of it is deeper than 3.000 meters so its temperature is greater than 100°C and its viscosity is low and HPAI is just a pressure maintenance method. This strongly suggests that the best depths to use HPAI for recovery of deep heavy is in the depth range of 800-3,000 meters. Dr. Kuhlman of MK Tech Solutions is a SPE Distinguished Lecturer in 2011 on “HPAI for recovery of deep heavy oil”. His lecture can be downloaded from this website.